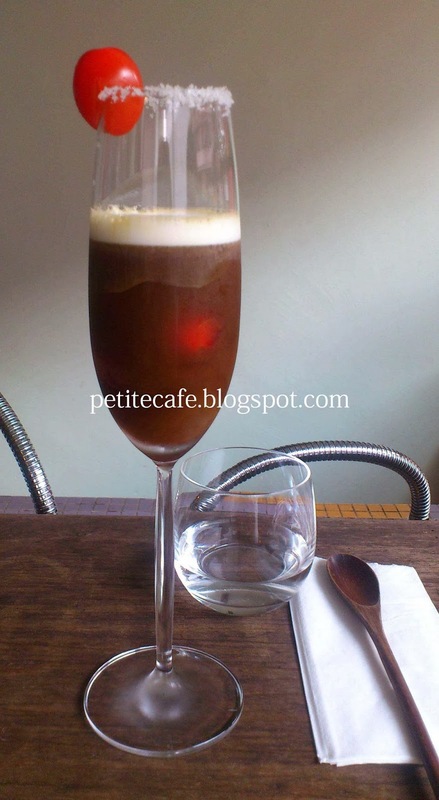 The cafe specialised in siphon and ice drip coffee but I choose to try its liqueur-based coffee. There were four to choose from - Jameson Whiskey (for Irish Coffee), Amaretto, Wine and another cream-based liqueur which I'm not familiar thus I don't remember the name but it was not Bailey or Kahlua. I decided to try the one with wine because it's something new to me. The place is very small and it was packed when I was there in the afternoon. I sat along the counter bar, squeezing in with other customers and this was where I got a good view of the barista preparing my drinks. First, she lined the glass with salt ala margarita. Then, she poured the wine in (Riesling, I recognised the label), the coffee and added in cherry tomatoes before she put the glass in the fridge to chill. I was puzzled by that - how long do I have to wait? Luckily, it was just few minutes. Lastly, just before serving, it was topped up with some milk foam. The cherry tomatoes was unexpected in a coffee. So was the salt. Later, when I asked the barista why these two ingredients are included, she said to give drinker a refreshing taste. Well, the cherry tomatoes were sweet and nice but the salt didn't appeal to me. The drink, just like the combination of ingredients, is unusual. It was not bad but it does not make me want to drink again next time. Perhaps others will know how to appreciate this concoction.